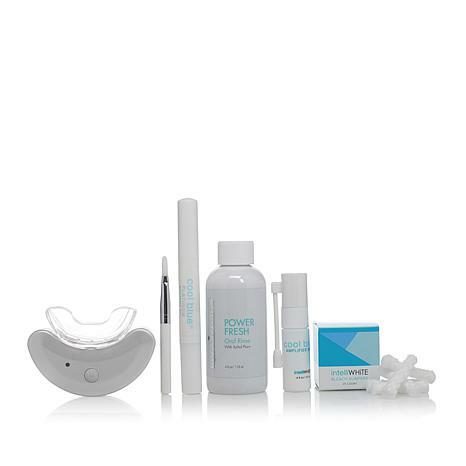 System that uses a whitening gel, a blue light, and an amplifier gel in a process called photo catalytic conversion to get your teeth on average 5.9 shades whiter in just 4 consecutive 10-minute whitening cycles. Insert mouthpiece into Activating Light. Place Bleach Bumpers in mouth. 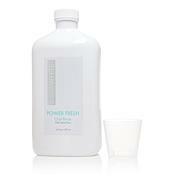 Paint CoolBlue Platinum Whitening Gel on front surface of teeth. 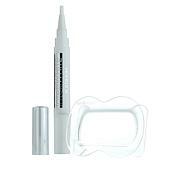 Hold Amplifier Spray 2 inches away from teeth and spray; may take 2 sprays to reach all teeth. Insert mouthpiece and turn on. Remove Cotton Bumpers (if desired). One treatment cycle lasts 10 minutes; Activating Light will shut off automatically. 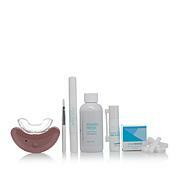 Wipe excess gel off teeth after each 10 minute cycle. Repeat all above steps up to 3 more times consecutively (for a maximum of four 10-minute treatments). Consult with a dental professional before use if you have untreated dental cavities or any form of gum disease. Products containing peroxides are not recommended for use by children under 12 years of age. Use for periods of longer than 14 days to be only under the supervision of a dentist. If irritation (such as redness, swelling, soreness) of the gums or the mouth occurs, discontinue use and consult a dentist. Tooth Whitening does not usually change the color of fillings and other restorative materials. It does not affect porcelain, other ceramics, or dental gold. However, it can slightly affect the color of restorations made with composite materials, cements and dental amalgams. Ingredients: Water, Xylitol, Polysorbate 20, Polysorbate 80, PVP, Mentha Viridis (Spearmint) Leaf Oil, Mentha Piperita (Peppermint) Oil, Moneammonium Glycyrrhizinate (Licorice Root), Flavor, Calcium Glycerophosphate, Menthol, Sodium Citrate, Sucralose, Zinc Chloride, Thymol, Citric Acid, Sodium Bicarbonate, Potassium Phosphate, Sodium Ascorbyl Phosphate, Potassium Sorbate, Sodium Benzoate, Benzoic Acid. THIS PRODUCT IS PRETTY GOOD WHEN IT COMES TO REMOVING SURFACE STAINS FROM YOUR TEETH WITH THE 4X 10MIN TECHNIQUE IT RECOMMENDS IN THE BEGINNING.. BUT THE PROBLEM IS ONCE YOU DO THIS REPETITIVE TECHNIQUE PER ITS RECOMMENDATION, YOU ARE ALMOST COMPLETELY OUT OF PRODUCT! THE UPKEEP CARRIES AN OUTRAGEOUS PRICETAG AND FOR THE MEDIOCRE RESULTS ACHIEVED, IT WOULD FINANCIALLY MAKE MORE SENSE TO JUST GET ZOOM WHITENING PROCEDURES IN COMPARISON. I DID THE MATH AND THEREFORE RETURNED THE KIT. NOT WORTH IT.